A staple rule of posting online is never write something you can’t stand by. Seems a simple lesson many young people are still learning. Don’t overshare or post something you won’t want to defend the next day. Fortunately, it appears a young, Alabama woman has become familiar with this lesson. All it cost her was her job. 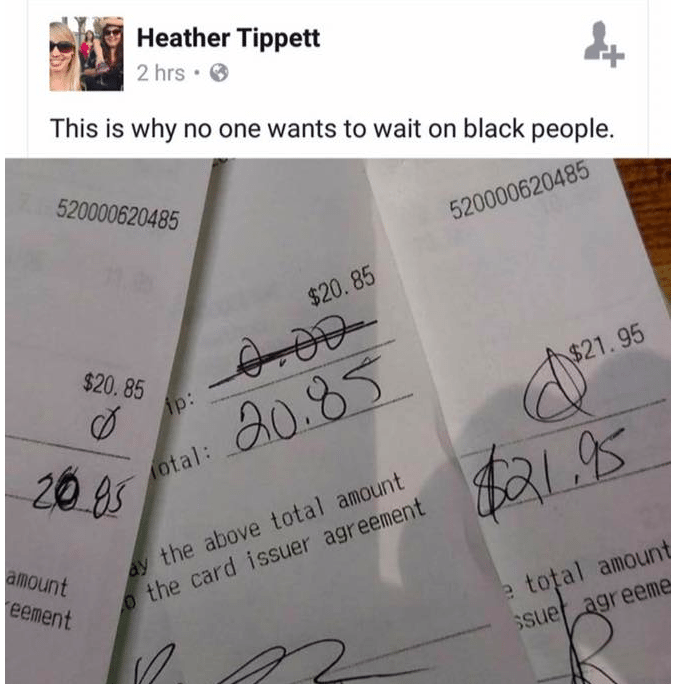 Heather Tippet, the waitress, was fired from a Mobile, Alabama, restaurant after she allegedly made racist remarks on social media. The customers she targeted were alerted because the pictures and harassment went viral online. Whether or not the tip was taken before waitress Heather Tippett got it is unknown, but her actions were called out for being despicable. She ended up not liking the attention and her Facebook page has been deactivated. The customers contacted Montego’s corporate office, and the waitress was terminated from her position. Hopefully, Heather No-Tip never forgets this lesson.